Alex was born and raised in the Soviet Union. 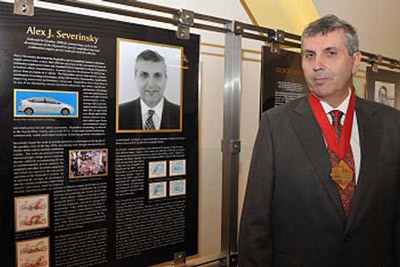 He earned a degree in electrical engineering from Kharkov College of Radioelectronics in Kharkov, Ukraine, in 1967, and his PhD in electrical engineering from the Institute for Precision Measurements in Radioelectronics and Physics in Moscow in 1975. He moved to the United States in 1978 and is now an American citizen. While waiting in long lines for gas in 1979, Alex figured there must be a way to make cars more fuel efficient. He began developing ideas for a hybrid vehicle but did not pursue them right away. He first spent several years working on high-voltage semiconductors and uninterruptible power supplies for computer systems. In 1991, Alex turned his full attention to creating the most efficient and cost-effective hybrid electric vehicle system possible. 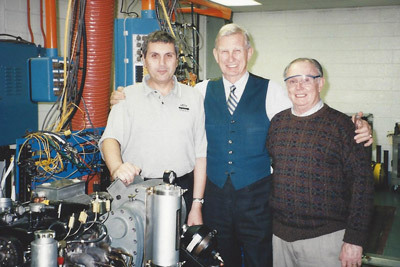 One year later, he formally established Paice and shared his vision: a hybrid electric vehicle that combined a traditional engine with one or more electric motors, all managed by a sophisticated control system. Paice was awarded its first hybrid vehicle patent in 1994. It unveiled a prototype of the Paice Hyperdrive technology in 1999 and testified about its hybrid technology before both the U.S. Senate (2001) and U.S. House (2002) alongside major automakers. Today, the company has 30 U.S. and foreign patents related to hybrid vehicle technology, including three of the four most important hybrid patents. Read more about the history of Paice. Alex’s inventions have been widely recognized. He was awarded the prestigious Thomas A. Edison Patent Award from the American Society for Mechanical Engineers in 2009. The award recognizes the creativity of Paice’s hybrid vehicle inventions as having the potential of significantly enhancing an aspect of mechanical engineering. It is one of the highest honors an engineer can receive. In addition, Alex was inducted into the University of Maryland Clark School of Engineering’s Innovation Hall of Fame in 2008 for his “pioneering work” in developing hybrid vehicle technology. Alex has been a visiting professor in the Clark School of Engineering for many years and formed Paice with the support of the Maryland Technology Enterprise Institute (Mtech), a venture incubator for early-stage companies. Alex launched Viteq, a company that developed uninterruptable power supplies for computer systems, in 1986. After selling the business, he began work on Paice in 1991. After stepping down as Paice Chairman and CEO in 2006, Alex was named Chairman Emeritus of Paice in 2006 and remains actively involved at the board level. As an advisor, he continues to provide strategic direction and share his technical expertise with the company. Alex also has started another business venture: Fuelcor. The company focuses on using carbon emissions to create synthetic fuels.